BURSWOOD celebrated Naidoc Week with students performing a traditional Aboriginal dance for staff at Crown Perth. Students involved in the Kiara Girls Academy program were invited by Crown to perform a dance on July 5 and chose Gathu Mawula Revisited, which represents women gathering food. West Coast Eagles player Sharrod Wellingham joined the celebration. Program manager Lisa Semmens said the students were really excited to be dancing and taking part in the Naidoc celebrations. “I’m proud to see the girls express themselves, share their indigenous culture, and develop into strong young women,” she said. Kiara College is one of 34 high schools across Australia in which the Girls Academy runs a program which increases the skills, employability, health and well-being of Aboriginal and Torres Strait Islander girls at school. In addition to health and academic objectives, the program also focuses on improving self-esteem and cultural connection. 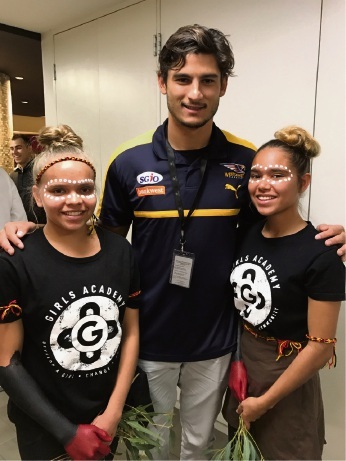 The Girls Academy works in the school system to drive community-led solutions to the barriers that prevent Aboriginal and Torres Strait Islander girls from completing their education and realising their potential. The Kiara College Girls Academy opened at the start of first term this year and has 52 students participating. The Girls Academy was founded by former Perth Wildcat and Olympian basketballer Ricky Grace, who serves as chief executive officer.